Jack retakes the Pork-Chop Express, but now must battle his way out of Little Tokyo. Picking up from last issue, Jack tries to step out of the sketch frame, but Attila hops in and exchanges blows with him. Jack finally steps out and Winona smashes the frame with Attila still inside, but Attilla manages to body slam his way out through a wall after some time. Shido activates his kappa beings and they attack Gadgeteer, causing him to fall out a window of the Negamaki Tower. Shido then directs them against Jack and Winona as they head for the vehicle storage where the Pork-Chop Express is being kept. Attilla kills Shido while Jack and Winona escape in the truck, but Attila takes the Skyhowl helicopter in pursuit. Gadgeteer has survived his fall thanks to his jetpack, landing in the street, but racing away from Negamaki Tower, Jack unintentionally drives over him, seemingly killing him. In Skyhowl, Attila pursues the Pork-Chop Express through Little Tokyo and onto the 101 freeway. Jack calls for help on his CB radio as he gives a blow-by-blow of the chase and the Reaganesque personality of the computer that controls the helicopter. He gets a response from another truck driver directing him to the Ronald Reagan National Archive. Upon arrival, Skyhowl's computer sees all the familiar associations with his human antecedent and crashes itself into the side of a mountain rather than inflict damage on the archive grounds. Attila is presumably killed. In an epilog to the story, back at the Dragon of the Black Pool restaurant in Chinatown, Eddie Lee has finally found a lead in the disappearance of his wife Margo Litzenberger and heads for Macao. The issues of this series did not have individual titles. I used the title "Take On Me" given in the next issue blurb of the previous issue. The author probably borrowed the title from that of the 1984 song by ah-ha. On page 3, Shido worries that time in prison would be no good for his rosacea. Rosacea is a skin condition usually affecting the face, exhibiting redness, papules, pustules, and general swelling. On page 4, Shido refers to the Gadgeteer as gaijin. This is a Japanese word for "foreigner". 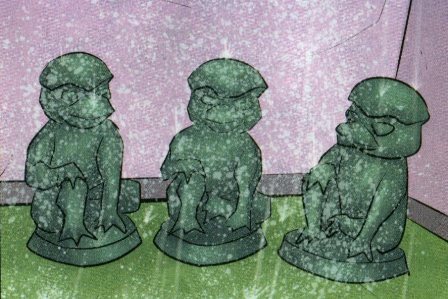 On page 5, Shido's kappa, turtle-like humanoids from Japanese folklore, are activated by the building's overhead sprinkler system for fire suppression. The turtles may also be a wink to Teenage Mutant Ninja Turtles, a comic book series that began in 1984 and has expanded worldwide into virtually every media, with maybe a dash of gremlins from the 1984 film called Gremlins thrown in. 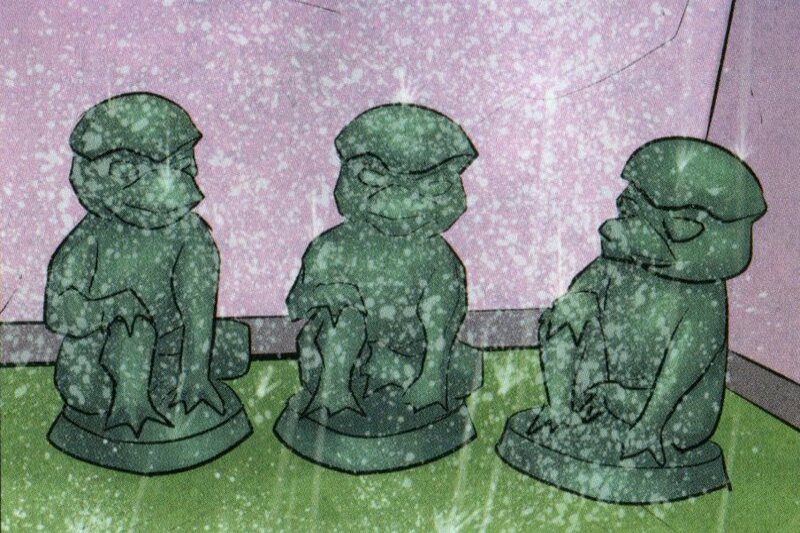 The inactive, statue-like kappas in panel 1 of page 5 look very similar to actual kappa statues in Japan. The van seen in Shido's collection on the left-hand edge of panel 1 on page 8 may be the Mystery Machine from Scooby-Doo. When Shido's body lands on the hood of the Pork-Chop Express on page 11, Jack shouts, "Jeezum Crumb!" This is a term occasionally used to express the exclamation "Jesus Christ!" in a less sacrilegious way. On page 12, we see Attila take the "Blue Thunder" helicopter in pursuit of the Pork-Chop Express (we first saw the helicopter chasing down the truck in the flash-forward in "Encino Man"). The helicopter is here called Skyhowl, a play on the Airwolf helicopter of the 1984-1987 TV series Airwolf. The computer aboard the Skyhowl has a cartoon-like onscreen representation that looks like Ronald Reagan, the U.S. president at the time both Blue Thunder and Airwolf were in production. The computer is called the Rotocraft On-Board National Navigation Intelligence Entity; notice that the acronym spells out RONNIE, the nickname used for Reagan by his wife, Nancy. When Attila first activates the computer, it says, "Well...hello, Mommy." Reagan was known for often opening his sentences with "Well..." and "Mommy" was a nickname he used for Nancy. RONNIE's opening targeting parameter is for hippies, described by it as "Hair like Tarzan's...walk like Jane's...smell like Cheetah's!" A hippy is a member of a liberal counterculture movement prominent in the 1960s-70s, continuing to a lesser degree up to the present day. Reagan was known for not being a fan of the hippy movement. Tarzan, of course, is the world-famous character of a British boy who was lost in the African jungle and raised by apes, created by Edgar Rice Burroughs in 1912. Jane was Tarzan's wife, Cheetah was the chimpanzee friend of Tarzan in movies of the 1930s-60s. On page 13, Gadgeteer remarks on buying parts for his jetpack at Home Depot. On page 14, Jack appears to accidentally run down Gadgeteer in the middle of the road, seemingly killing him. On page 14, RONNIE drops a couple of bombs on the street, targeting the Pork-Chop Express, and says, "Mr. Gorbachev, I will blow down this wall!" This is a reference to a famous quote by President Reagan, "Mr. Gorbachev, tear down this wall!" It was said at the Berlin Wall in 1987 to challenge Soviet General Secretary Mikhail Gorbachev in his new policies of glasnost (openness) and perestroika (restructuring). Jack gives an ongoing account of the chase over CB radio, at one point saying, "...pursued by a crazed whirlybird programmed with the personality of the greatest commander-in-chief to ever adopt a chimp in the movies." 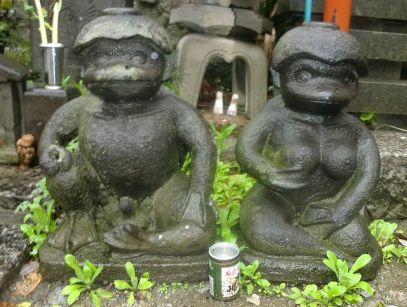 Reagan was a former actor and in the 1951 comedy film Bedtime for Bonzo, his character tried to raise a chimpanzee named Bonzo as if it were a human child. On page 15, Jack tells his listeners on the CB that he's currently heading north on the 101. This is an actual freeway that runs north-south through Los Angeles. As Jack asks for help over the CB, he ends his plea with "10-10 good neighbor..." "10-10" is CB slang meant to indicate that the operator will stop broadcasting but is still listening. Panel 3 on page 15 shows that Jack's CB is currently tuned to channel 19. This is the channel most frequently used by truckers. On page 16, Taffeta Darling responds to Jack on the CB with "10-17" and Jack with "10-4". "10-17" means "urgent business" and "10-4" "acknowledged". The character of Taffeta Darling appears to have been inspired by Kurt Russell fan girl, model, and cosplayer, Taffeta Darling. The character even looks like her. Check out her pop culture website, thetaffetadarling.com. Taffeta directs Jack to take the 156A exit from the 101 and head west on the 118, where he finds the Ronald Reagan National Archive. There is no Ronald Reagan National Archive in the real world, but it would appear this is a stand-in for the Ronald Reagan Presidential Library, which is off of California State Route 118. Additionally, there is no Exit 156 off the 101. On page 17, a statue in front of the Ronald Reagan National Archive appears to show Ronald and Nancy Reagan, with the President's foot pinning Mikhail Gorbachev to the ground! On page 18, RONNIE says, "You know what the scariest words in the English language are? I'm from the government! I'm here to help!!!" This is a paraphrasing of a quote Reagan made in various forms throughout his conservative political career. On page 19, Jack remarks, "We won one for the Gipper." Reagan was known by the nickname "The Gipper" after his role of George "The Gipper" Gipp in the 1940 film Knute Rockne, All American. In the film, Gipp, a university football player for Notre Dame, falls fatally ill and tells his team to "win one for the Gipper." On page 20, some employees of the Reagan National Archive remark on the megadrought the state currently suffers through. Though California has been suffering drought for the past several years, it is not technically a megadrought, which lasts 20 years or longer. 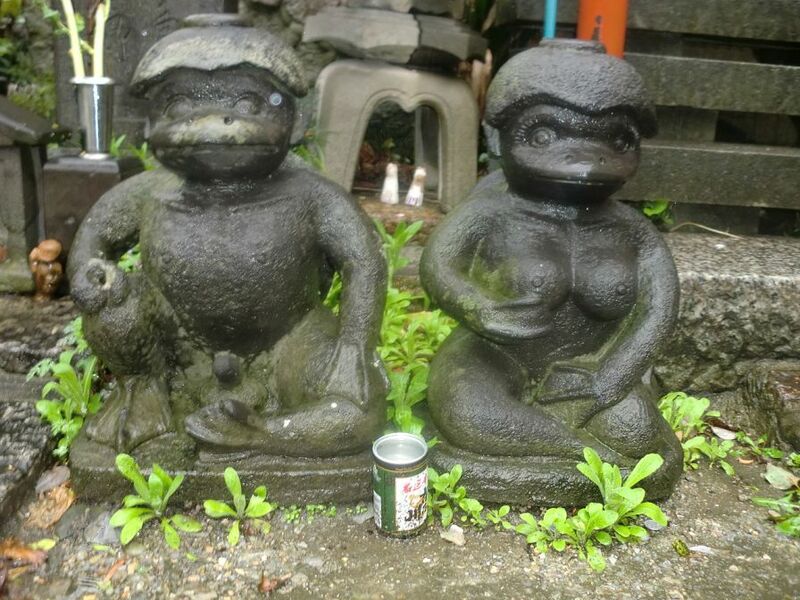 The legend the groundskeeper tells of the kappa needing to keep water in the impression on top of their heads is accurate to Japanese folklore. At the end of the issue, Eddie heads off to follow-up a lead on the disappearance of Margo. The Russian wizard she was investigating at the time of her disappearance, Koschei, is making an appearance at the Kunlun Casino in Macao. "Koschei" is the name of an antagonistic supernatural character in Slavic folklore. Kunlun Casino appears to be a fictitious business in the Macao autonomous territory of China. On page 21, Wang reveals that Eddie had been manager of the Dragon of the Black Pool restaurant for a time, over 20 years ago, but hasn't held a job since and hasn't even stepped foot outside in years.